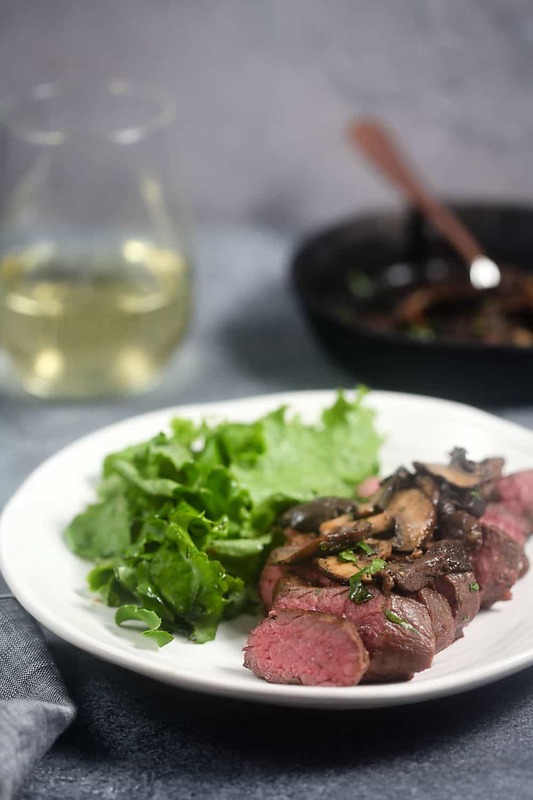 Sirloin Steaks with Miso-Butter Mushrooms + a Visit to Ameele Farms | Healthy. Delicious. 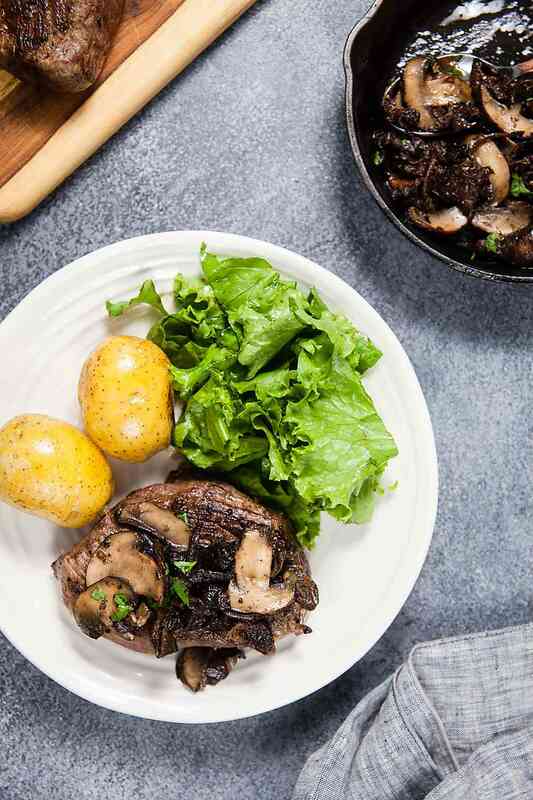 If you’re looking to jazz up your steak dinner, look no further than these miso-butter mushrooms. They’re full of rich, umami flavor that pairs perfectly with beef. The way I eat steak changes dramatically based on the season. In the summer, I keep it simple: throw it on the grill, grab some steak sauce, and call it a day. Once grilling season winds down, I tend to get a little fancier: I slice it over salad and add wasabi peas and hoisin vinaigrette, or rub it with coffee and serve it with vanilla-tomato relish or cranberry salsa. 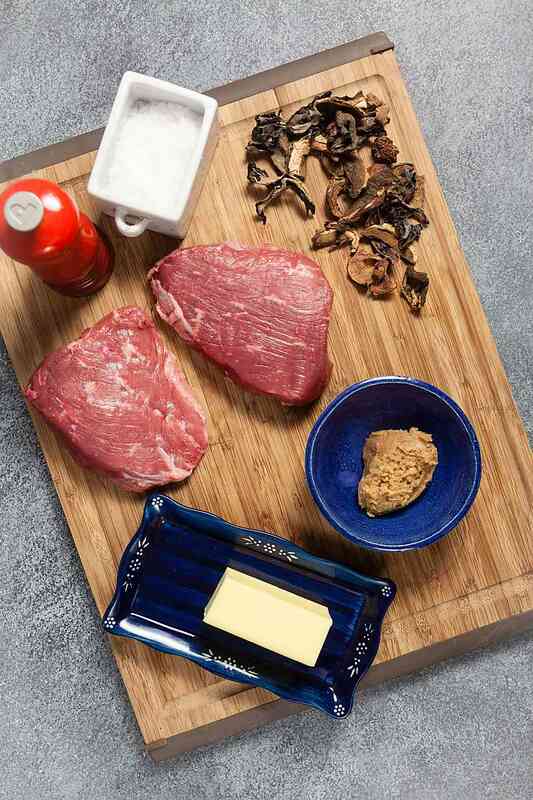 This time, I decided to go for an umami bomb – steak smothered with a medley of mushrooms cooked in miso-butter. It’s shockingly easy, but oh-so-delicious. This recipe is the first in a series of beef recipes that I’ll be creating for my client Moyer beef from now through the end of the year. Moyer is a brand that sources beef from small family farms in the Northeast, which can be found at many Tops Friendly Markets. The beef is great quality (USDA grade Prime or Choice) and I’m really excited to come up with some new recipes for them! Earlier this month, I actually had the privilege of touring a few beef farms with the New York Beef Council. New York isn’t known as a big beef state – I’ll admit that when I see cows on the side of the road I’ve always assumed they were dairy cows. It turns out that we do produce a surprising amount of beef here though! 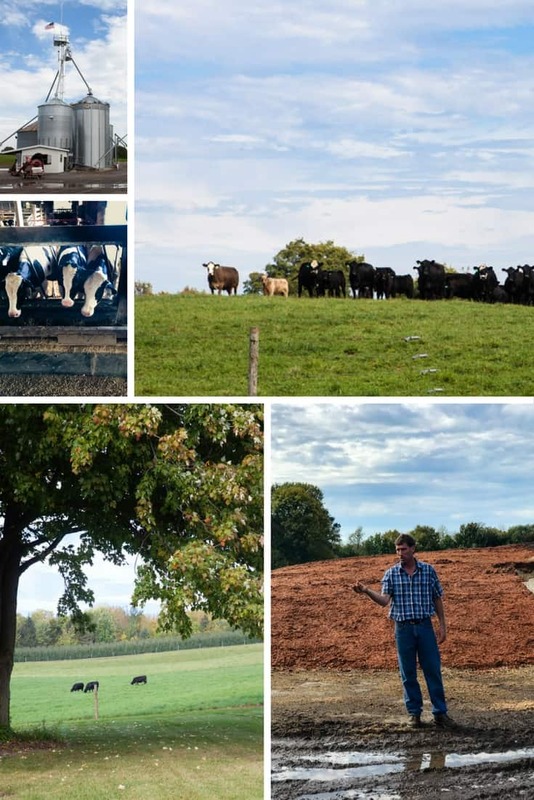 New York’s beef farms tend to be small, family-owned operations – 99% are maintained by part time farmers and, on average, they have 29 head of cattle. One of the farms I got to visit was Ameele Farms, one of the family farms that Moyer partners with. Located in Walworth, NY (Wayne County), Ameele Farms is one of the largest in New York State. It spans about 2,000 acres (roughly 2.5 square miles) and has 500 head of cattle as well as crops like corn and apples. Ameele Farms was started as a hobby farm in 1930 but has since grown into a full time operation run by Mike Ameele and his wife, Colleen. The cows at Ameele Farm spend the majority of their lives on grass with their mothers, with 1 cow and 1 calf per acre of land. Once they reach a certain weight, the cattle (typically steers) are moved to a barn where they’re fed a mixture of grasses and grains to help promote efficient growth and ensure they have good marbling. One thing that really impressed me about this farm was Mike’s commitment to efficiency and innovation. For example, the cows live right next to the feed lot, so he can cut down on transportation costs. He also cuts hay early so that it has more nutritional value – and so he can get more harvests per season – and he uses apple pomace (a byproduct of the cider he makes from his orchards) instead of plastic to cover feed. Farming is a difficult job that doesn’t come with many rewards, but when we asked Mike why he does it he said “it’s in my blood!” and that he couldn’t imagine doing anything else. I’m definitely glad there are people like Mike and Colleen around to do the job! 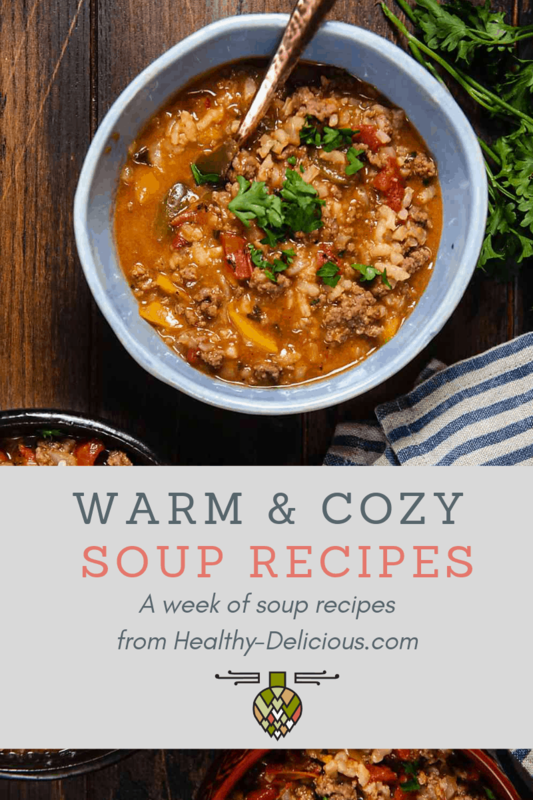 But let’s get back to that recipe – you won’t believe how easy it is to make! First, season the steaks liberally with salt and pepper and drizzle them with some olive oil. (Sirloin is very lean, so a little added fat helps it get a nice crust and keeps it from sticking to the pan.) Cook the steak to your liking – I suggest medium-rare or medium – then remove it from the pan and tent it with foil while it rests. Return the pan to the stove and add a big pat of butter and some olive oil. Add some garlic and cook it for a minute or two, until it begins to soften. Now, whisk in a big spoonful of white miso. 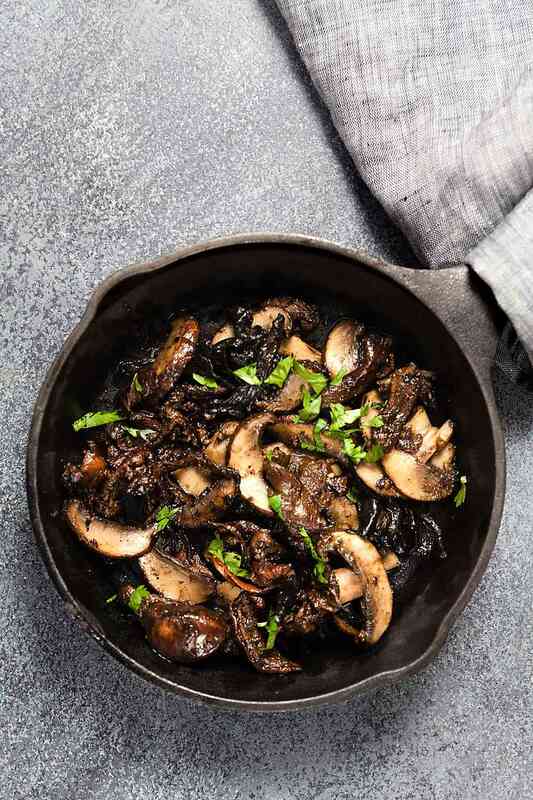 This will create a delicious glaze that really brings out the savory notes in the mushrooms. Add the mushrooms – I used a mix of fresh criminis and dried trumpet, chanterelle, and porcini mushrooms that I rehydrated in water – and let them cook until they soften and brown. Deglaze the pan with a glug of sherry vinegar, sprinkle it with chopped parley, and season with black pepper. 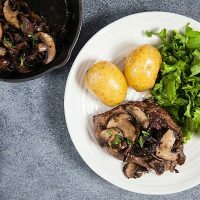 I like serving these steaks topped with the miso-butter mushrooms alongside a simple salad and boiled potatoes. Season the steaks on both sides with salt and pepper. Rub with olive oil. 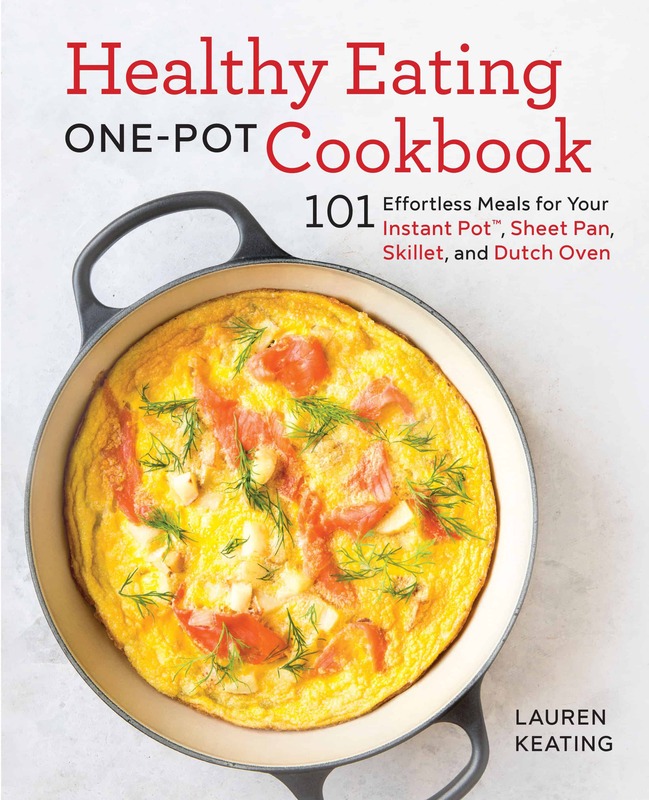 Heat a heavy skillet – preferably cast iron – over high heat. Add the steaks and cook 4-5 minutes per side, or until cooked to your desired level of doneness. Remove from the pan and tent with foil; let rest while you cook the mushrooms. Return the pan to medium heat. Add the butter and oil and let melt together. Add the garlic and cook 1 minute, or until fragrant. Whisk in the miso. Add the mushrooms and cook, stirring frequently, for 5-6 minutes or until the mushrooms are browned and the liquid has reduced to a thick glaze. Stir in the sherry vinegar, scraping up and browned bits from the bottom of the pan. Sprinkle with parsley. Season to taste with salt and pepper. 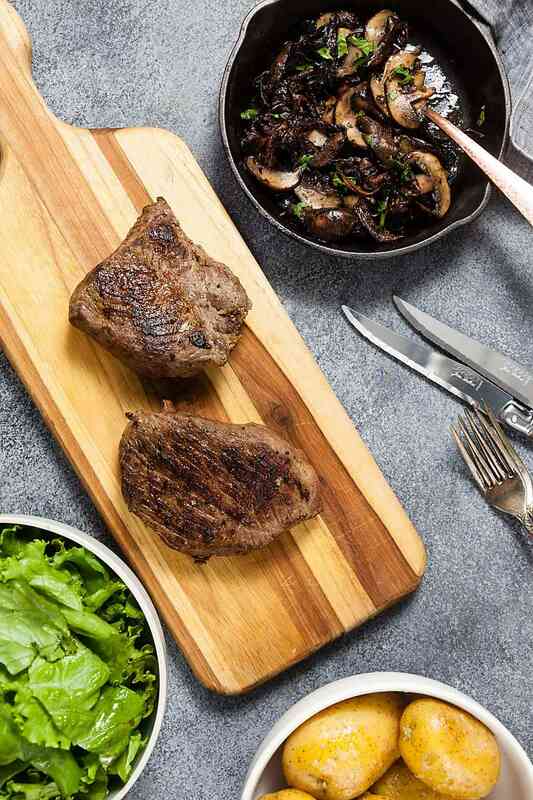 To serve, slice the steaks across the grain. 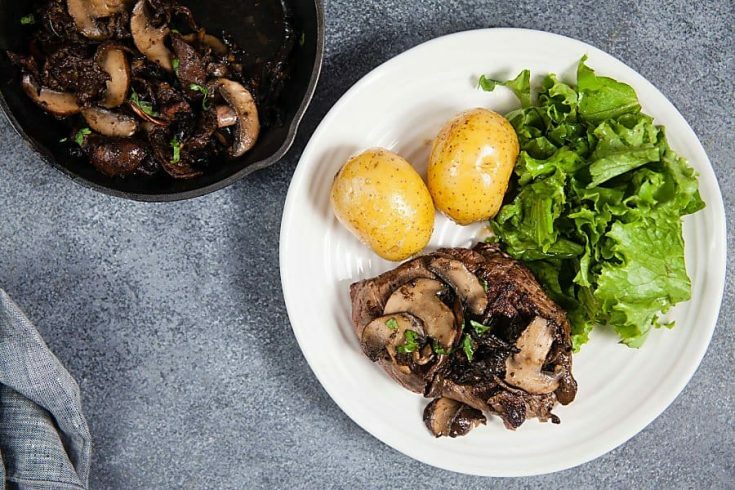 Top with miso-butter mushrooms.